Jack Nicklaus may have celebrated 50 years as a PGA of America Member this year, but his first encounter with the Association took place in 1950, when PGA Professional Jack Grout called him out of a group of youngsters at Scioto Country Club in Columbus, Ohio. Nicklaus said he can still hear Grout’s rapid-fire instructions. “Hey, Jackie boy, show them how to hit a golf ball into the air,” said Grout. Jack Nicklaus would go on to become golf’s most successful performer, adding five PGA Championships to a record 18 professional major titles. During his career, he maintained a bond with the PGA, which officially began with his election to membership, June 1, 1966. 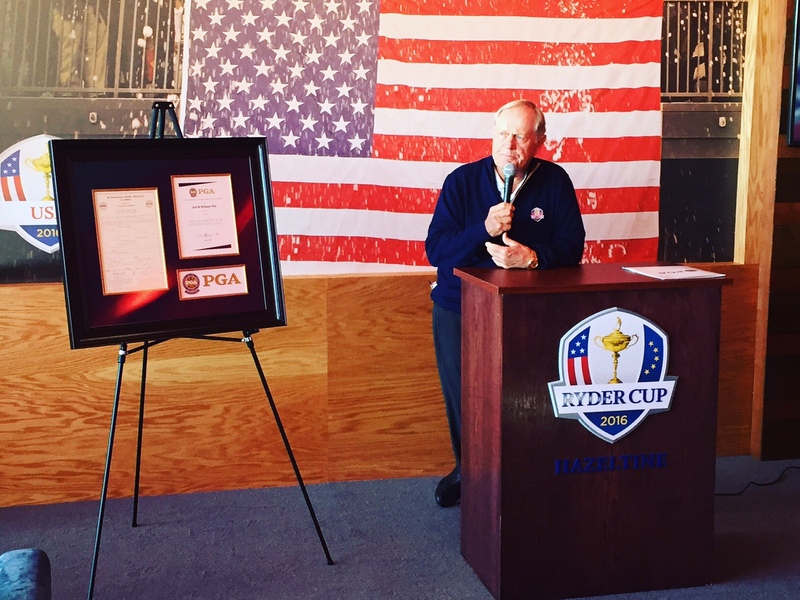 On Saturday, Nicklaus was presented with a framed copy of his PGA Membership application by PGA President Derek Sprague at the PGA Members Pavilion hosted by the Minnesota PGA Section. Said Nicklaus, “The PGA has always been very supportive of everything that I’ve done, for which I am great appreciative. I always enjoy going around the country and walk into a club or course and know that I’m welcome. Nicklaus competed in his first Ryder Cup in 1967, and would go on to be instrumental in the event’s current lofty perch among sport events worldwide by campaigning in 1977 for the inclusion of Continental Europe.